This driver(version1.10) provides improved performance in USB-B and USB micro B function. Device driver: Installation of driver with administrator privilege is needed if PC terminal is used under Windows OS. Extract compressed file and execute “Setup.exe” in the folder. Install shield wizard starts by execution of setup. Check “I accept the terms in the license agreement” if you are agree with the agreement. Connect USB terminal (type B) in back panel on MAP-S1,SRS-X9/X88/X99,CMT-SX7/SX7B,CAS-1 , h.ear go (SRS-HG1) and USB terminal (type micro B) in front panel (USB micro B) on RSX-GS9 and USB terminal on PC by USB cable. 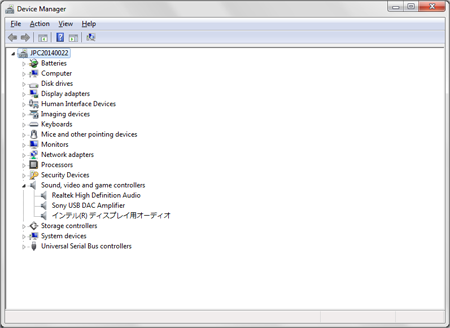 If installation completes correctly, Sony Audio is added to Sound, Video and Gaming controller on Device manager. Make sure the driver is installed correctly. If installation of drier is correct, “SONY Audio” is found in device manager, please check [!] is not displayed. - Device manager window is displayed by left click My computer > Property > Device manager. - If “SONY USB DAC Amplifier” is not displayed, please uninstall driver and install it again. By some software output device of sound can be selected. In such software, please check if SONY Audio Driver is selected correctly as output sound device. “SONY Audio” is selected as Playback device, which displayed Start > Setting > Control panel > Sound. And also check Volume is set to maximum and not muted at Property of ”SONY Audio”. Please proceed setup file for uninstallation.